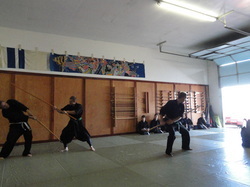 In the Kashiwa Bujinkan Dojo, Ninjutsu is pursued in a holistic method of personal development. The way of the Ninja becomes a way of life. Unlike the medias portrayal of the "Black robed assassin" the historical Ninja (or Shinobi) was in truth a fully actualized human being. Their skills made them impeccable defenders of themselves, their families, and their homes. Just as it was then the modern Ninja trains in effective resolution in any conflict. Students at the Kashiwa Bujinkan Dojo learn to break through personal limitations, fears, and barriers. Our dojo is set in a traditional but enjoyable atmosphere designed to cultivate real world martial skill. 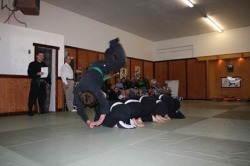 Students begin with foundational Taijutsu (effective body movement) and Taihenjutsu (acrobatics) that teach effective movements in possible combat situations. NInjutsu consists of specialized punching, kicking, and striking methods. Grappling, pressure holds and locks are also utilized as well as throws, chokes, and many other marital applications. We train in many basic and exotic weapons including: sticks, staffs, chains, sickles, swords, throwing stars and blades, spears, blinding powders, caltrops, to just name a few. Weapon training is learned as a result of skillful Taijutsu where the weapon becomes a fluid extension of the wielder. A realistic approach to handling real world conflict coupled with a rich historic tradition allows each student to asses a personal sense of power and success.